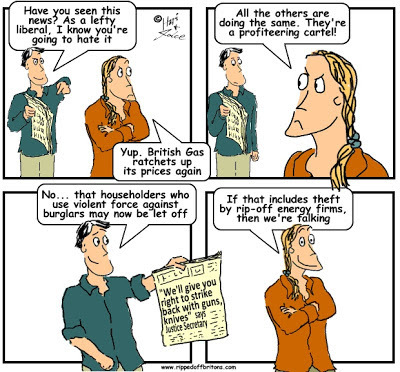 A British politician, the Prime Minister no less, promises to legislate that Britons must not be ripped off! Something truly remarkable happened in Parliament on 17th October 2012. A moment so rare we should give it a name – "Bloomingheck Day". A British prime minister, not covered by a shower curtain singing into the spray before breakfast but in full view of parliamentary television (19 minutes 15 seconds into the video), promised to legislate uncompromisingly against a long running rip-off. For clarity as well as suspension of disbelief this was said by David Cameron, Prime Minister of the United Kingdom of Great Britain and Northern Ireland, during Prime Minister’s Questions on 17th October 2012 shortly before lunch (thus presumed sober). That was it. It was not followed with weasel words on how the best deal is not always the cheapest, or how the best deals need only be "offered" (in the knowledge that people don't trust "offers" from companies, and so ignore them). Crystal clear, no smoke, no mirrors, say it again: “We will be legislating so that energy companies have to give the lowest tariff to their customers”. It soon became clear that Cameron had kept this promise secret from his team of politicians and hangers-on. Even his own cabinet minister responsible for energy policy hadn’t heard of it. To get this into the legislative programme Cameron evidently had to smuggle the policy into Parliament under his jumper. The easily confused Labour Party, reacting with the drooling predictability of a Pavlovian dog, unthinkingly condemned the statement as "something out of the Thick Of It". People of all odour, of all complexion, of all persuasion: don't tell Cameron he is a confused ninny and hand him the Asperger's defence on this. Reassure him he is quite lucid and make him get on with it! “I'm not quite sure where the prime minister was coming from." "We need to understand the detail of what's being proposed by the Prime Minister"
We must take a moment to congratulate Ms. Knight on her seamless move from CEO of the bankers’ club (British Bankers Association) reappearing as CEO of the energy companies’ cabal Energy UK. Her career brings to mind that of Bela Lugosi, the 1930’s film star, who also followed a terrifying career as Dracula with a scary stint playing Frankenstein. Different role, same objective. But savour the moment when a British Prime Minister had the nerve to act in the best interests of all Britons, rather than just his pals and donors. Close your eyes, breathe deeply, slowly count to ten, and savour. It happens just once or twice in a lifetime, like true love. OFGEM, the energy regulator, doesn't want transparency. OFGEM rejected all the recommendations for greater transparency made in their own 2012 report for greater visibility on energy company profits. The British Bankers Association (BBA), blind to years of LIBOR rate setting fraud. The Office of Fair Trading allowing banks to promote scams such as 'teaser' rates which can be quietly dropped to nothing, and rip-off overdraft charges. The OFT's investigation into teaser rates concluded: "After considering the evidence, we did not find any information suggesting there is substantial harm caused by firms offering temporary bonus rates of interest. We do not consider it appropriate to require cash ISA providers to transfer consumers to identical accounts with higher interest rates automatically." HMRC provides tax avoidance loopholes for privileged citizens and companies to march through arms akimbo riding camels. This results in rises in taxes and cuts in services for those Britons who can't afford a crafty accountant, private healthcare, and public school fees. Train companies touting tickets designed for maximum complexity, with some fares cheaper if you buy multiple tickets for a single journey. Buy London to York, and then York to Durham - you save money quite legally even though you stay in the same seat for the whole journey. Ripping off Britons is enshrined in our consumer protection law. The law only requires companies to not rip off the 'average consumer', leaving the other 50% as fair game. Most of these rip-offs depend on confusion and secrecy. When the deception is revealed, as it was with Payment Protection Insurance, we see the multi-billion scale of the scams. Latest reports state the PPI compensation bill is going to top £15billion. It is clear the highest in the land have no compunction about looking you straight in the eye and lying. Generals have lied to the face (and on camera) to either their potential clients on their willingness to peddle influence, or to the public on their unwillingness to peddle influence at the MOD. Politicians have fibbed on what they said to police officers; whether they were secretly backing private companies they were supposed to be supervising; how dodgy the dossiers leading to war were; whether they aided kidnapping and rendition to torture countries; and much more. Those with responsibility for the actions of others - Newspaper magnates, government ministers, archbishops and cardinals, BBC handlers of celebrities -have casually dissembled about what their staff get up to. When their dissembling is finally exposed they admit to "no fault responsibility" for the misdeeds of their underlings. "no fault" = no need to scold, sanction, or sack them. They want to draw a line, forgive and forget, and move on. They do this because they know for a rip-off to work it is not necessary to fool all the people all the time. You just need to fool most people for the length of their attention span. It's not that we believe them, just that we can't be bothered to do anything, believing anything would be futile. An energy minister has been accused of rowing back on David Cameron’s promise to bring in new laws to put all households on the cheapest possible deal."